For the first time, a seasoned business executive and avid golfer combines these two passions to explore what makes for top performance in each field. Management consultant David K. Hurst explores compelling links relating the two activities to explain clearly what every manager who plays golf may feel only intuitively: that there is a deep systemic connection between them. For on the tee, as in the boardroom, a player can't just hit and hope -- he or she must continually think ahead, contemplate multiple scenarios, and consider the downside of every decision. And then everything depends on execution. In Learning from the Links, Hurst clarifies muddled thinking in both management and golf: he deals squarely with the challenge of implementing a game plan and seeing it through. Hurst takes to task the current "head-down" instructional model used to teach golf and management. He addresses the huge gulf between knowing what to do in a given situation and knowing how to do it. This chasm is an ever-present hazard both on the course and in an organization: it keeps people from solving their problems and achieving their goals. By examining golfers' and managers' struggles for improvement, Hurst shows us why complex systems are so hard to change and how to set about changing them -- systematically. Using the latest thinking from fields as diverse as neuroscience, artificial intelligence, art, and anthropology, Hurst's primary purpose is to help his readers make sense of their own experience -- to help them learn more effectively. 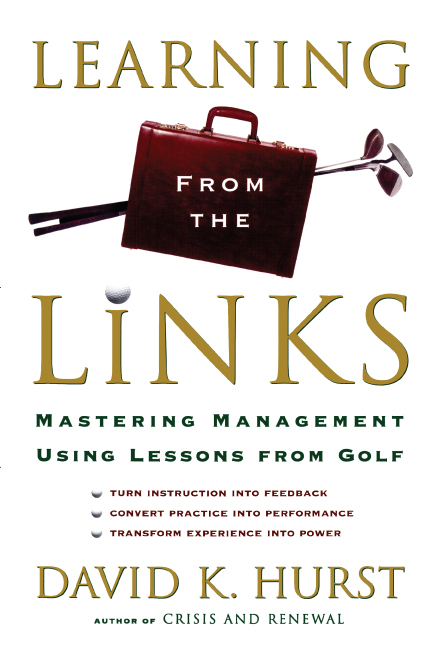 His practical advice is profusely illustrated with examples from both golf and management, allowing the reader to move back and forth between his or her experiences in both activities. Part business management book, part strategy guide, these are more than just lessons for one's game or one's office: these are lessons for life.